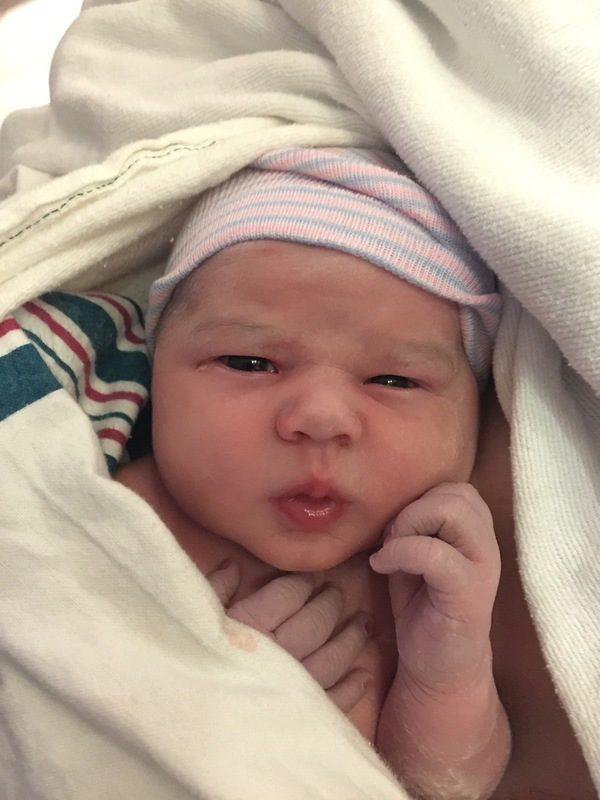 So – Baby Girl is here! And for those who care – here is the birth story in a nutshell. We scheduled an induction on her due date because I’m selfish and was tired to being pregnant…I started my day at 4:30 Thursday morning, after hitting the snooze button several times and also after several aniexty dreams – one which involved going to check on my son at grandma’s house to discover that she woke him up two hours after he fell asleep because she practices the Susan B Anthony method. Don’t research that, it’s not real. But in dreamland we both knew what it meant and I got upset and raised my voice at her, telling her that the Susan B. Anthony method was outdated and she needed to get with the times. Apparently my son’s sleep is very important to me and I would even snap at my mother-in-law to protect it. I realized as soon as I woke up how ridiculous that was. Anyway, Chewy and I got to the hospital at 5:45. My doctor said he would break my water and things would progress “quickly” from there. I’m not sure what “quickly” actually means. To me it means there’s no time for anything else after that! Urgent, urgent, urgent! You know – like in TV shows where the woman all of a sudden says, “it’s time!” and they’re zipping through the streets trying to get to the hospital before the baby decides to enter the world. That’s quick – in the real world I think those experiences are extremely rare (my sister has had one so I can’t completely eliminate them as probable). Anywho – over here, let’s finish the story. So I’m prepped and ready to go when the doctor gets there sometime between 7 and 8 to break the waters. I won’t go in to detail but that was quite possibly more painful than delivery (I refer to Stormy’s delivery since my epidural had worn off). The worst part, he wasn’t able to do it because my body hates me and likes to cause emotional damage as often as possible. He decided to wait until I’d had my epidural. But reassured me that once the water broke it would go quickly. So they started me on pitocin and then we waited. My contractions gradually grew but nothing I couldn’t handle. It was only after Chewy fell asleep and my mom started to do stuff for work that they got worse. I didn’t want to bother anyone so I just grit my teeth and squeezed the handle of the hospital bed. A nurse came in and asked how I was doing and kind of answered for me – it was like, “how ya doing? Everything good?” and so I nodded my head in agreement. I don’t think clearly sometimes. Anyway, before the nurse returned the next time my mom had noticed, Chewy sat up and did his hand holding job and when the nurse came back we upgraded my pain level from a three to a five and I told her I wanted the epidural. When she left to get that set up my mom said, “you say 5 but your face said 7″…as if I really understand these pain numbers anyway. I got the epidural, which hurt but after it started to take effect everything and everyone was absolutely agreeable. I noticed I could still kind of move after my epidural, which I couldn’t move at all the last time I had gotten one. The doctor returned to break the water, I tensed at the memory of the first arrempt but this time I didn’t feel anything, he said I was dilated to an 8 and then said, “things should move quickly now” and I said, “you’re done? !” So like that – my water was broken. It was within an hour that I was ready to push, in fact I wasn’t too sure the baby would wait for me to push, I could actually feel the pressure of her getting ready. I got nervous about that because for some reason a baby slipping out on their own freaks me out and I never want to see or hear of that actually happening. The doctor came back not a moment too soon, they got me ready to push and then I remembered the instructions from the first time I gave birth and tried to push. I couldn’t feel a thing though so I wasn’t sure it was even working. With Stormy it had hurt so much, but I could tell I was doing my part. With Gertie (that’s her fetal name) I “pushed” and then looked at the doctor as if to ask, “did it work?” then he’d tell me to push again, once more…and wallah! I had a daughter. I didn’t feel a thing, I pushed maybe three times in 7 minutes and there was a baby (Stormy was an hour of pushing). Born at 5:59 pm – which made my mom the winner of the bet that she, Chewy and I had over what time she’d be born. Then the doctor lifted up this nasty little thing, covered in white something or other which came from inside of me…I just stared at it wondering what he wanted me to do about. Did he expect me to touch it? For reference – with Stormy, he was taken right away because he had already passed his first bowel movement so they had to check him and they went ahead and cleaned and weighed him before I had skin to skin time with him. So this was new for me. And it was gross. The nurse grabbed Gertie and laid her on my chest and it was no longer gross. …until that is, she peed on me…not once, not twice, but three times (at least I hope it was pee). Gertie and I were able to stay skin to skin for quite some time as they finished everything with me (you know, stitching, pushing, poking, prodding). We were taken to our room around 8:30-9 pm with our sticky baby and were told all about our paperwork as if we hadn’t been up since 4:30 in the morning and just gone through a physically exhausting experience. They took Gertie away to clean her, then brought her back for some nursing. It was almost midnight before they came to take her back to the nursery and I was finally able to get a few hours sleep. With that long winded story (sorry, I know I promised a nutshell but I’m a wordy person) – here is the first picture of “Gertie” (they cleaned her face up while I held her).